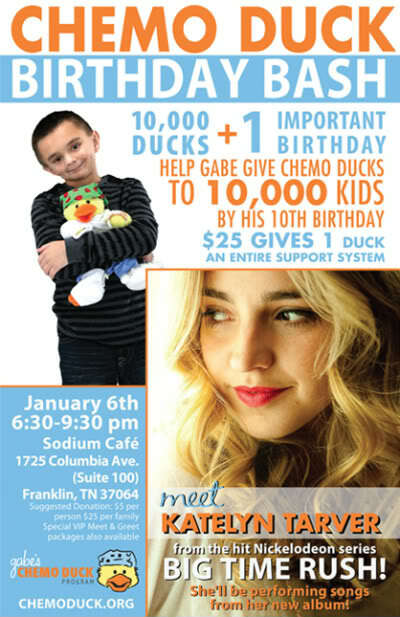 Nashville, TN — Cancer survivors, caring families and fans of the hit Nickelodeon series “Big Time Rush” will all gather in Franklin, Tennessee, on January 6 for the Chemo Duck Birthday Bash, benefiting Gabe’s Chemo Duck Program. The all-ages event will feature live performances by actress/singer Katelyn Tarver (“Jo” on “Big time Rush”) as well as local favorite Charity Vance. Sponsored by Let it Shine Gymnastics and Applebee’s of Spring Hill, Chemo Duck Birthday Bash will take place at Sodium (1725 Columbia Avenue) from 6:30 p.m.-9:30 p.m. The event will serve as the official kick-off of a year-long campaign to provide 10,000 Chemo Ducks to pediatric cancer patients in 2012. Admission is free, with a suggested donation of $5 per person or $25 per family. All proceeds from the event will be used to place more Chemo Ducks into the hands of young cancer patients waiting for a duck of their own. Chemo Duck Birthday Bash will include food and drinks, photo opportunities, door prizes and a silent auction which will include Chemo Ducks personally autographed from a variety of celebrities including Trace Adkins, Beyonce, Ke$ha, Reba McEntire, Brad Paisley, Vince Gill, Charlie Daniels, Backstreet Boys, Travis Stork, The Judds, Amy Grant, Olympic Gold-Medalist Nastia Liukin, the Broadway cast of “American Idiot,” the cast of Nickelodeon’s “Big Time Rush,” Ben Harper, Danny Gokey, Michael W. Smith, Collin Raye, Billy Ray Cyrus, Blessid Union of Souls, Kelly Clarkson, Crystal Gayle, Florence Henderson, Marc Broussard, Michelle Branch, Julianne Hough, Kenny G, Staind, Pat Boone, Laura Bell Bundy, Twisted Sister, Richard Marx, Olivia Newton John, Rupert Boneham and Jordin Sparks. A limited number of V.I.P. Tickets are also available, which include a private Meet & Greet and red carpet photo with Katelyn Tarver, as well as a gift bag that will include autographed CDs from Katelyn Tarver and Charity Vance.